Biology and life history During mild winters, the black cutworm overwinters in field debris and brush as a pupa. Otherwise, it flies in from warmer climates in late spring. 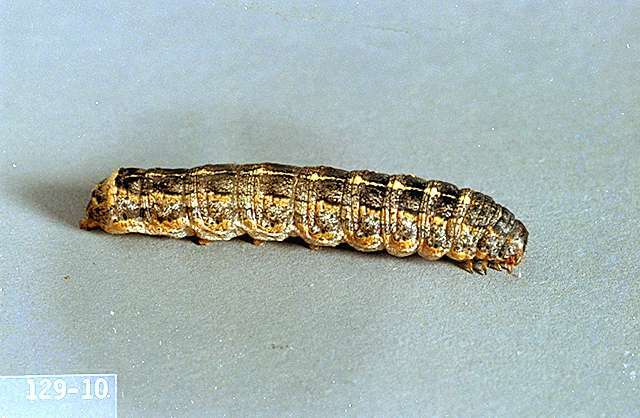 The variegated cutworm overwinters in the soil or under trash as a partially mature larvae. The larvae begin feeding in early spring and may do damage to seedlings. Larvae mature in late April and May and pupate in earthen cells in the soil. Adults emerge in late May and June. 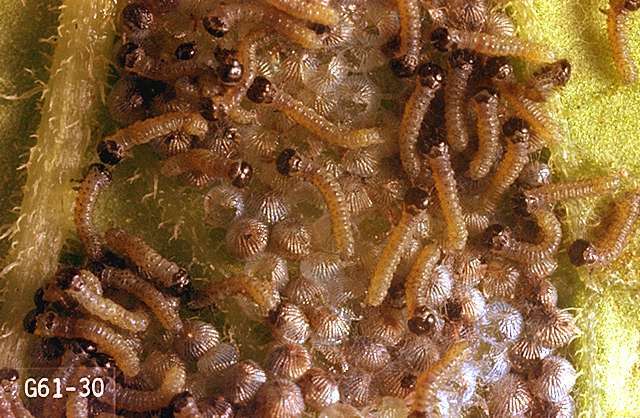 Eggs hatch in 4 to 7 days, and larvae begin to feed on plant foliage. Larvae feed for 4 to 6 weeks, then pupate in the soil. Adults emerge in late August and lay eggs which hatch into larvae. These form the overwintering stage for the variegated cutworm. There are two generations each year. Pest monitoring Pheromone traps can be used to monitor for cutworms in conjunction with field scouting. 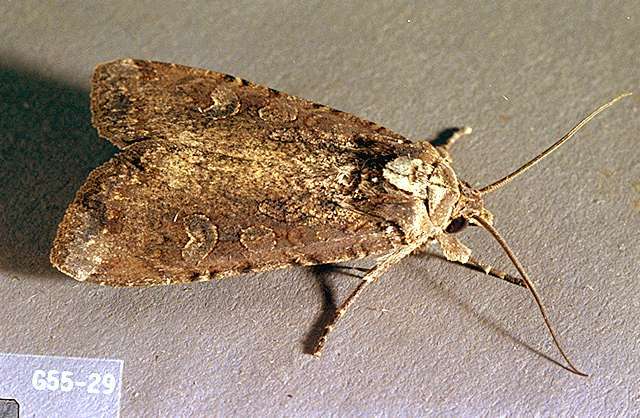 Moth counts in excess of two black cutworm moths per trap per day indicate significant egg laying pressure. 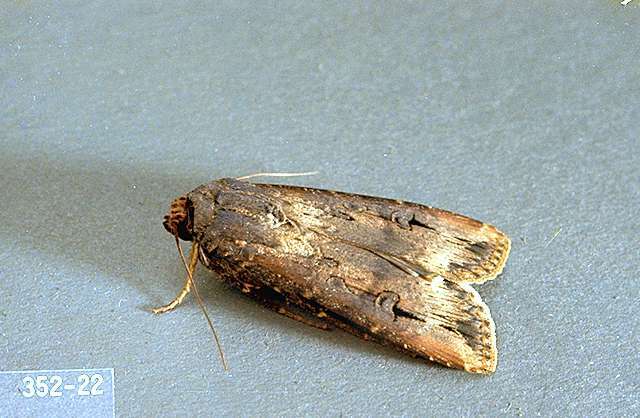 When moth counts exceed this level, intensify field scouting at crop emergence and during stand establishment. Cutworms are most injurious in fields with high plant residue. Historically, cutworms are a problem in early, spring-seeded seedling fields. Tillage prior to seeding is an effective means of reducing cutworm damage. A thorough harrowing between rows may reduce the number of cutworms feeding actively in established fields. azadirachtin (Neemix) at up to 0.04 lb ai/a. PHI 0 days. REI 4 hr. Neemix is OMRI-listed for organic use. bifenthrin/IBA (Empower 2) at 0.04 to 0.1 lb ai/a. PHI 7 days. REI 5 days. Do not exceed 0.5 lb ai/a per season. Retreatment interval 7 days. Limit 5 treatments. bifenthrin/zeta-cypermethrin (Hero) at 0.04 to 0.1 lb ai/a. PHI 7 days. REI 12 hr. Retreatment interval 7 days. Limit 5 applications. Do not exceed 0.45 lb ai/a per season. carbaryl (Sevin 5 Bait) at 2 lb ai/a as granule. PHI 3 days. REI 12 hr. Retreatment interval 7 days. Limit 3 treatments per year. chlorpyrifos (Lorsban 75WG) at 0.5 to 1 lb ai/a foliar; 2.25 lb ai/a soil. PHI 21 days foliar; 30 days soil. REI 24 hr. Do not exceed 3 applications per season. cryolite (Kryocide) at 7.7 to 15.4 lb ai/a. PHI 7 days REI 12 hr. Do not exceed 94 lb ai/a per season. Some formulations are OMRI-listed for organic use. cyfluthrin (Tombstone) at 0.013 to 0.025 lb ai/a. PHI 0 days. REI 12 hr. Do not exceed 0.2 lb ai/a per season. (Belt SC) at 0.063 to 0.075 lb ai/a. PHI 8 day. REI 12 hr. Do not exceed 0.225 lb ai/a per season. Retreatment interval 5 days. lambda-cyhalothrin/thiamethoxam (Endigo ZC) at 0.064 lb ai/a. PHI 1 day. REI 24 hr. Retreatment interval 7 days. Do not exceed 0.24 lb ai/a of lambda-cyhalothrin or 0.172 lb ai/a of thiamethoxam per season.